Ever heard of a 42” magnificence in the form of a TV? If not, then you have to see the Samsung PS-42P4 Plasma TV performance, for knowing what it means when I say magnificence! With sparkling clarity and razor sharp images produced, the ecstasy of TV viewing is understood better in this TV. An aspect ratio of 16:9, and resolution of a wonderful 1024 x 1024, the brightness peak for this TV comes to 1100cd/m2 with the contrast ratio coming to 1000:1. The viewing angle is 160 degree, which is a bit disappointing, compared to the size of the screen and similar models from Philips and other leading companies in the market giving higher viewing angles of about 176-178 degrees. The progressive scan option reduces the flickers produced in the TV, thus giving cleaner and distortion free images. A Picture in Picture mode helps in watching two or more channels in a single screen, thus optimising the use of the wide screen. An audio output of 15W each comes with each speaker, a total of 2, along with a Virtual Dolby Sound decoder and SRS TruSurround sound options also are available. Preset sound modes like Music, Floor, Cinema, Standard, personal etc are set previously itself in the TV. The TV also has a PC input that helps in viewing, multimedia and other contents in a PC, in the wide screen of the TV. The power consumption comes up to about 330W, which is again expensive, an affair. With the overall weight being about 35kg, it comes with a silver colour remote. Overall, this model is a good one with all latest features and Samsung’s state of the art technologies used. Ignoring certain drawbacks, which any model would have, like the power consumption, weight of the unit etc, this TV is definitely recommended and a good choice! 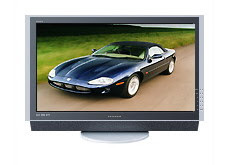 You can read reviews of HD Plasma Televisions on Akai, Philips, LG, NEC and Pioneer Plasma TVs at Plasma TV reviews site.